During this time of year, we all take a step back and realize the countless blessings we have in our lives. And for a group of young athletes, their method of giving thanks was the sport of basketball. The St. Thomas Aquinas Sports Association hosted the second annual Giving Thanks Basketball Classic at the Flatlands parish over the Thanksgiving weekend. 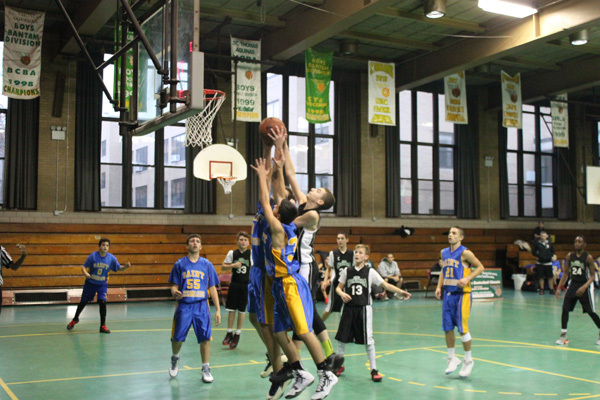 Eighth-grade teams from St. Thomas; Good Shepherd, Marine Park; St. Athanasius, Bensonhurst; St. Columba, Marine Park; and St. Ephrem, Dyker Heights, played a competitive slate of games over the tournament’s three days. But in addition to some great basketball action, this particular tournament serves a different purpose: to help a local family in their child’s battle against cancer. Last year, the tournament supported Eddie McCarthy, a student at Xaverian H.S., Bay Ridge, who had a brain tumor and is now doing very well. This year, all proceeds benefitted the family of Aiden Seaver, an eight-year-old boy from St. Athanasius, diagnosed with acute lymphoblastic leukemia on Aug. 12. Aiden had been getting fevers this summer and complained of body aches, but since the family is very active in the outdoors, his mother, Eve, thought he could have Lyme disease. But upon a trip to the emergency room after three straight weeks of doctor visits, the family found out the true diagnosis. With the support of his mother, his father, Tracy, his older sister, Guinevere, and the entire St. Athanasius parish community – especially pastor Msgr. David Cassato – Aiden battled the leukemia into remission after a rigorous schedule of chemotherapy. The treatment schedule will continue for two years, but a lighter dose over the second year will allow him to go back to school. Domenick Priante, the director of the Giving Thanks tournament, became aware of the Seaver family’s situation through working together with Eve at Franklin Delano Roosevelt H.S., Borough Park. As a result, Aiden became the recipient of the tournament’s funds. Aiden has been a stronger fighter these past few months, which provided plenty of inspiration for the competing teams. For his valiant fight, Aiden received the tournament’s “Warrior Award” during a presentation on the final day. This year’s “Thank You” Award went to Camille Loccisano, the founder of Frankie’s Mission, a nonprofit organization that provides support to families of pediatric cancer patients nationwide. Through the tournament, the teams were able to give thanks for their own blessings and support a family in need, all while playing their favorite sport. Now that is a win-win situation. “We are playing a game we love to show that we love him (Aiden) too and will help support him,” said Anthony Orlando, a guard on the St. Athanasius team. “It shows Aiden that he has a lot of people supporting him, even people that he doesn’t know,” said Justin Maiman, a forward on the St. Columba team. Aiden will continue his fight against leukemia, and it will certainly help his family knowing they have an entire support team on their side, which is why they are giving thanks this holiday season. Donations to the family can be made at www.stagtc.myevent.com.